As many listeners are aware, Bartók was not only a devotee of folk music, but was one of the foremost experts of his time in Eastern European folk music, collecting over 6,000 folk melodies and arranging many of them for various instruments and ensembles. His Six Romanian Folk Dances are fairly straightforward renderings of their folk tune derivatives. Thus, as he did in his large collection for piano, For Children (1908-1910), Bartók elaborated little on the source materials, fashioning each piece to be a simple miniature of a half-minute to a minute in length. 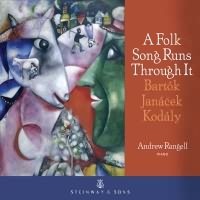 For the Folk Dances, Bartók used seven melodies from fiddle tunes (though the score is divided into only six sections). The tunes were collected between 1910 and 1912 in Maros-Torda, Bihar, Torda-Aranyos, and Torontal. Bartók was drawn to Romanian folk music, instrumental music in particular, because of its timbral diversity -- Romanian folk dance tunes are often performed by ensembles comprised of diverse instrument combinations -- and its variety and quality of tunes. For Bartók in 1915, these Romanian instrumental tunes offered greater possibilities than the instrumental folk tunes from his own native Hungary, as attested by the number of his works based on Romanian themes. The first of the Romanian Folk Dances is "Stick Dance," a colorful, lively piece whose infectious buoyancy and carefree gait exude delightful Romanian flavors. The ensuing "Sash Dance" has a start-and-stop manner throughout its half minute, the bouncy music pausing to catch its breath after each phrase. The third item, "In One Spot," combines a simple pulse in the bass with an exotic theme in the upper register, the whole yielding a gypsy-like character of striking quality. Number four in the collection is "Horn Dance," a slow piece whose childlike simplicity (both in rhythm and theme) conveys an innocence in its pastoral, somewhat wistful melody. The next piece, "Romanian Polka," brims with ethnic color and merrymaking in its lively rhythm and peasant-like dance theme. The only regret the listener might have here is that the composer did not go on a bit longer than the mere half-minute he spent, in light of the colorful and utterly infectious foot-stomping material. The last of the pieces in the set is "Fast Dance, which features two themes, each of similar character. They are both breathless in their pacing, each conveying a sense of unbridled celebration.